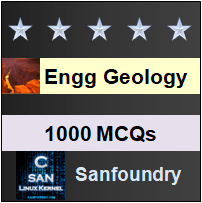 This set of Engineering Geology Multiple Choice Questions & Answers (MCQs) focuses on “Sedimentary Rocks and Their Mode of Formation”. 1. Which rock is also called secondary rock? Explanation: Sedimentary rocks are also called secondary rocks. This group includes a wide variety of rocks formed by accumulation, compaction and consolidation of sediments. 2. Which is the rock present in majority on the surface of earth? Explanation: Sedimentary rocks are known to cover as much as 75 percent of the surface of the earth the rest being covered by the igneous rocks and the metamorphic rocks. 3. What are the mechanically formed sedimentary rocks also called? Explanation: Sedimentary rocks are broadly grouped into three classes on the basis of their mode of formation: Mechanically formed or Clastic rocks: Organically formed rocks and chemically rocks which are called as Non-clastic rocks. 4. Detrital rocks refer to which type of sedimentary rocks? Explanation: During the formation of the sedimentary rocks by mechanical method, original hard and coherent rock bodies are gradually broken down into smaller fragments. This disintegrated, loosened material is called detritus. Hence, clastic rocks are often also called as detrital rocks. Explanation: The most important phenomenon that happens to the sediments during their transport and deposition is sorting or grading according to their size, shape and density. 6. Deposition takes place in which conditions? Explanation: The sorting or grading occurs during the deposition stage of the formation of sedimentary rocks and the deposition happens in layers in most cases. Deposition generally takes place under ordinary pressure and temperature conditions. Explanation: The process of transformation of loose sediments deposited in the settlement basins to solid cohesive rock masses either under pressure or because of cementation is collectively known as diagenesis. Explanation: Welding is the process of compaction of the sediments accumulated in lower layers of a basin due to the pressure exerted by the load of the overlying sediments. Explanation: Diagenesis is achieved by two methods. They are, welding and cementation. Cementation is the process by which loose grains or sediments in a settlement basin get held together by a binding material. Explanation: Limestone may be formed by precipitation from carbonated water due to loss of carbon dioxide. Rock salt may be formed from sodium-chloride rich seawater merely by the process of continued evaporation. Explanation: Chemically formed rocks are of two types: precipitates and evaporites. Examples are limestones, rock salt, gypsum and anhydrite. 12. Pick the organically formed sedimentary rock. Explanation: Limestones are the best examples of organically formed sedimentary rocks. Generally, the evidence of the source material gets obliterated from these rocks with the passage of time. 13. How is the degree of packing in welding related to load of overlying sediments? Explanation: Welding initially involves squeezing out of all or most of the water from in between the sediments, thus bringing them closer and closer and hence resulting in compaction. In fact the degree of packing of sediments in a sedimentary rock is directly proportional to the load of the overlying sediments. 14. Animal and vegetable life don’t contribute to the formation of sedimentary rocks. State true or false. Explanation: Animal and vegetable life, including microorganisms also contribute a fairly large supply of organic residues, which on gradual accumulation after the death of the source get compacted and turn into hard massive bodies of sedimentary rocks.